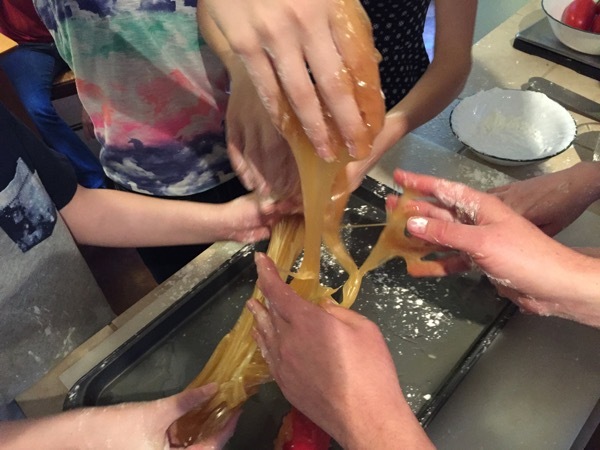 DolciDeleria: Taffy Pulling, Because Science! It started with an idle comment. It ended up a many-houred end-of-school-year sugar-coated event. This goopy stuff is homemade salt water taffy. An exploration of sugar, chemistry, and the relative strength of various arms. I gave the kids (Caitlyn and some homeschool friends) a short lecture about atomic structure, molecular bonds, solutions (and why it's not a reaction), and what it means to be supersaturated. I'm never really sure how these little talks land with the kids; Caitlyn always says very positive things but the others are often so quiet I'm not at all certain anything sticks. I've decided to take the steady deluge approach: if they are always swimming in lots of knowledge, eventually some of it will osmosis its way to permanence, right? Then, on to the sweet part! 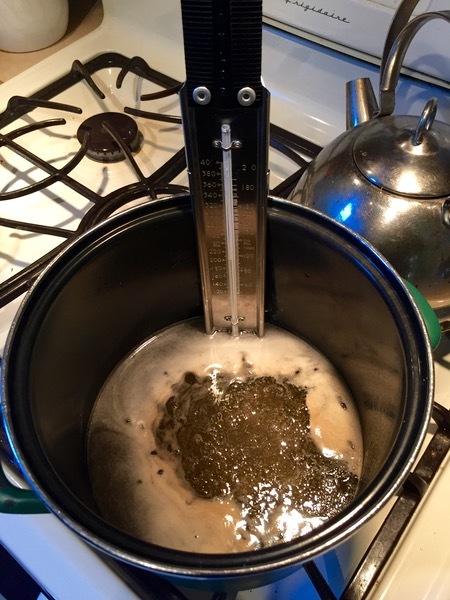 Taffy syrup needs to cook over low heat until it's 260 degrees. High heat will scorch the sugar (don't stir or you'll end up with gritty candy), so this process is long and slow. I sent the kids outside and read half a novel. Two hours later, we finally hit the proper temperature. 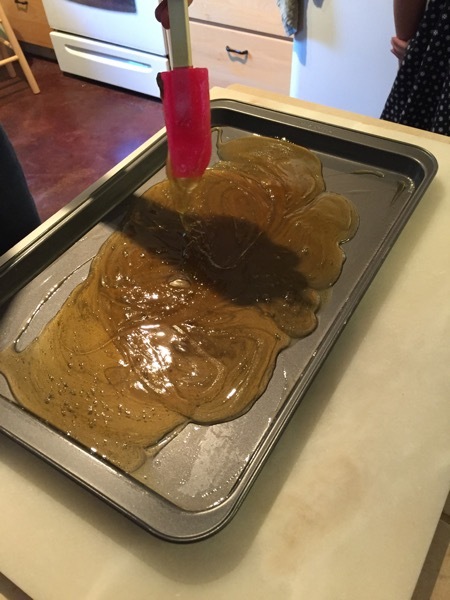 For taffy, you want the candy to cool quickly, before crystals can form. This is also the point when you add any flavorings. The kids chose peppermint, which vaporized on contact with the molten sugar and cleared the sinuses of everyone in the kitchen. As soon as you can touch it without injury, you start pulling. 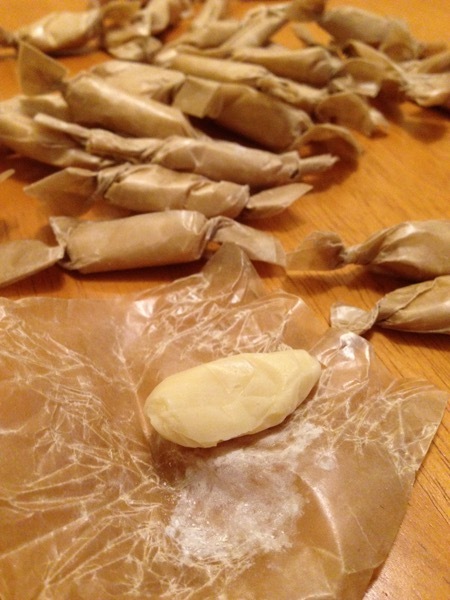 The point of pulling taffy (it's stretch and fold, really) is to incorporate air into the candy. This makes it light and chewy in texture. Of course, it's really sticky. We started with cornstarch on our fingers and that wasn't at all effective. Cornstarch all over the hands wasn't much better, buying you a couple of minutes of reduced stickiness. Butter was more effective, but it also worked its way into the candy, leaving you, well, sticky. I wonder if starting with butter and then having someone sprinkle powdered sugar in as the butter was absorbed would be effective. 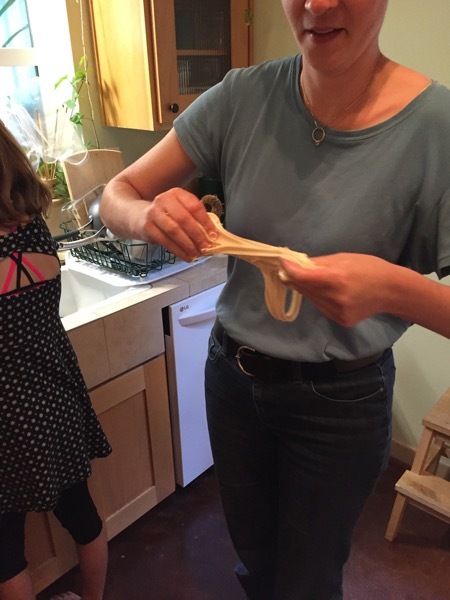 I'm guessing that if you can pull the taffy long enough, it becomes less sticky, but I'd need to make more taffy to test this theory. Eventually, it does become white, opaque, and firmer to the touch. And you become aware of which arm is your dominant (the one that hurts less) and how you could probably benefit from some additional exercises to tone up those shoulder and upper arm muscles. 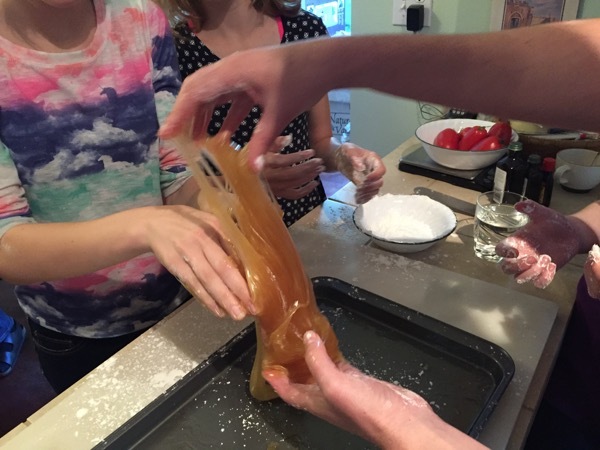 There were 8 of us (kids and adults) pulling taffy, and we probably should have pulled it longer than we did. Pulling it all myself doesn't sound like fun at all. The final product is pretty fine taffy. It's light and chewy, pleasantly peppermint without searing your sinuses (having done that already). Each of the kids involved got to take home a ziploc of candy. Not a bad way to mark the end of the school year!